My first reaction to this exhibit was a sudden remembrance of “The Crystal World” by J.G. Ballard, where nature is transformed into a beautiful, but icy menace — fragile, but deadly. And although the art objects in “Imaginary Botanicals: Sculpture in Glass” are displayed in protective cases and behind cords in the Central Gallery at IMAS, it is for the objects’ protection, not ours. With works that sometimes appears as icy spectacles, California-based glass artist, Kathleen Elliot, has created an alternative reality with an unusual material. “Imaginary Botanicals” is about objects inspired by nature, but not necessarily adhering to its laws. Elliot’s glass working background began by lampworking glass to make beads, but later blossomed because of her experiences at Dale Chihuly’s Pilchuck Glass School, where she learned to control and master the medium. Within this exhibit, there are different series representing slightly different expressive directions. 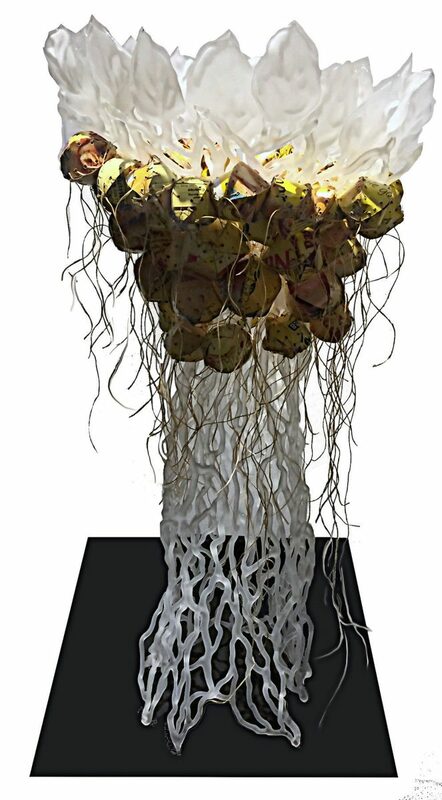 There is a modest offering of natural botanical sculptures in the show, such as “Melons,” but the imaginary botanicals, which include pieces from the artist’s Liberty Series, Offerings Series, and Questionable Foods Series command center stage. Reproduced through glass blowing, “Melons” depicts examples of actual foods with leaves and twigs made by flameworking glass sheets and tubes. The impressive natural coloration on the surfaces of objects were achieved with tinted powders and frits, and deserve close attention; this technique is remarkable. The imaginary botanicals are achieved in the same way, but with a surreal twist to the game of nature. Elliot attributes the influence of Carlos Castaneda on works that create metaphors through combinations of the medium, subject, and human psyche. "Garnet Tumbleweed Before its Tumble" by Kathleen Elliot. This takes us to the predatory and tightly wound sculpture, “Angst”, significant for its visual capture of a dark corridor of the human condition. 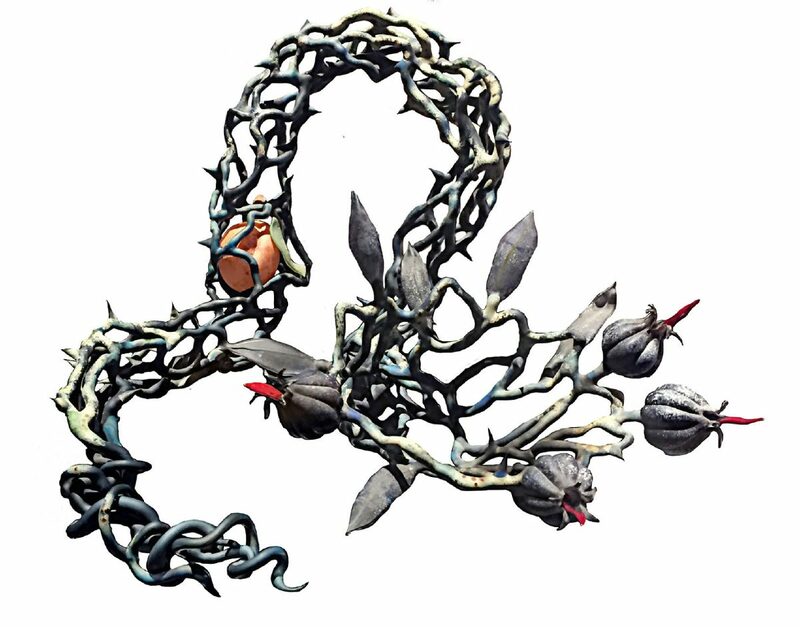 The concept is brilliant, and the treatment of color on the briar-like structure is amazing. This piece lives somewhere between a carnivorous plant and the repressed subconscious, depicting a dangerous and sentient nature. “Pomegranate Pod” takes the natural world and translates it into a mesmerizing experience. 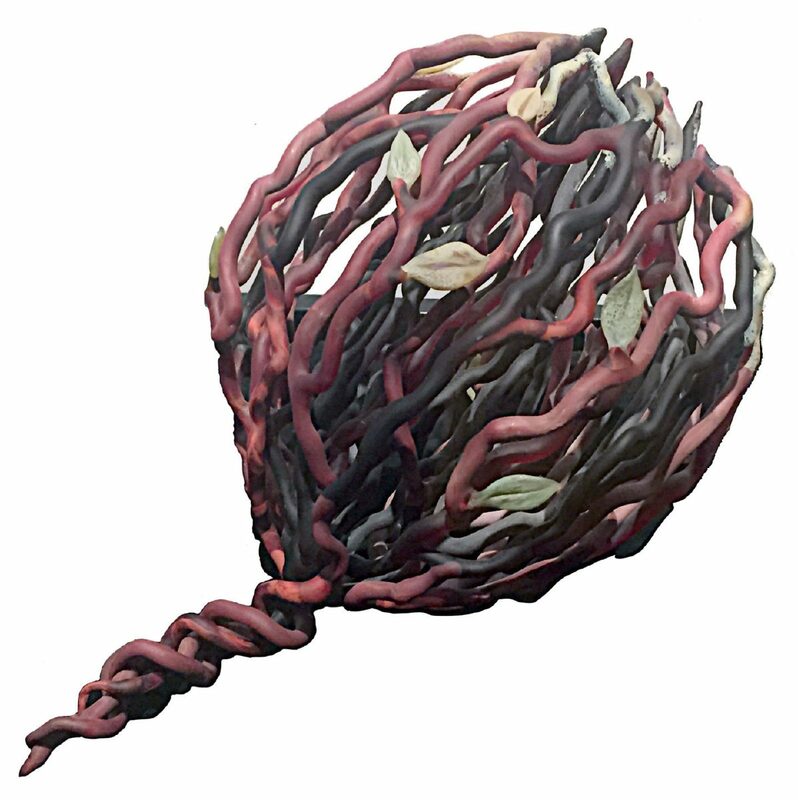 A lacey pod is tipped with a dark red coloration that is reminiscent of human veins, slowly sending life through its open, basket-like container toward three colorless seeds. The translucent linear structure also occurs in “Questionable Foods #5,” which draws the viewer in through its perceived ethereal beauty. 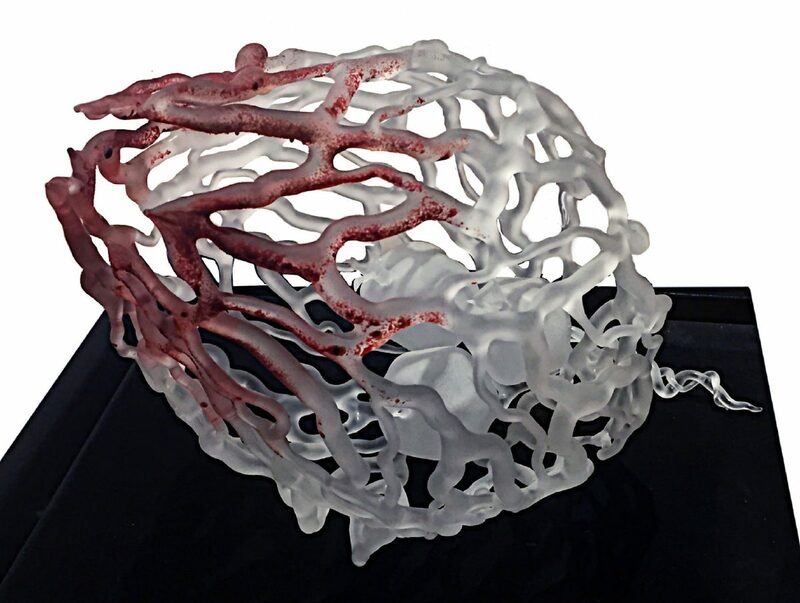 The translucent line structure mimics veins in the human body and suggests an exuberant life form, but it is not. Upon closer examination, the pods in this piece are composed of stitched together toxic processed food packaging. In this series, Elliot takes her glass into the forum of social commentary. The overall take-away from this exhibit is the dualism of nature. The fragile glass is a chilling metaphor for our natural world in a time of natural and human assault. “Garnet Tumbleweed Before its Tumble” confronts us directly with the imminent possibility of destruction. 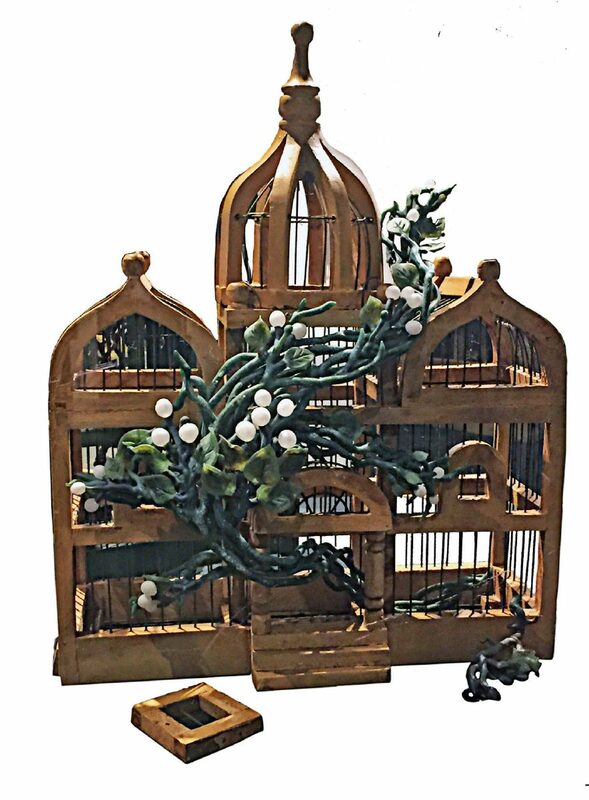 As though to reassure us as to nature’s endurance, “Liberty #2,” combines a found wooden birdcage with glass vines. A dark green vine boasting bright white berries twines its way through the man-made structure, and will eventually overpower it. An in-gallery video shows the artist working and talking about her inspirations for this fascinating exhibit. 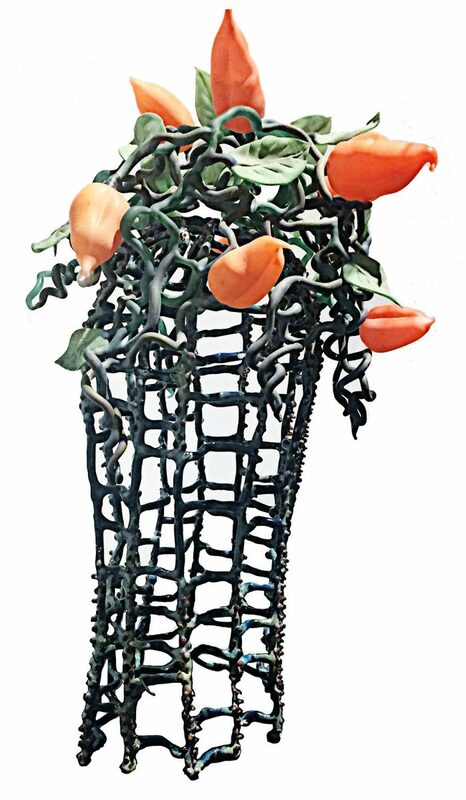 “Imaginary Botanicals: Sculpture in Glass” is excellent and should not be missed.